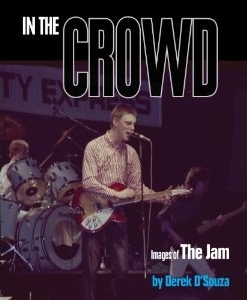 A local Worcester Parkarian who spent years photographing the Jam and did their Absolute Beginners record sleeve in 1981 has had a book of his images published and has offered a pack of souvenirs and images plus an invitation to the book launch in Soho to one lucky blog reader to celebrate. Photographer Derek D Souza who lives in Brinkley Road was a huge fan of the band and took hundreds of photos of them in the late 70’s and early 80’s, many of which have been compiled into his new book ‘In The Crowd’ which will be released on the 1st of May. (Presale discounts are available at the moment). Derek is offering one blog reader a jam packed Jam pack containing a souvenir pack of postcards, wristband and plectrum, catalogue book of 20 images that will be in the book and an 8x10 print of Paul Weller (all signed by the photographer) plus an invitation to the book launch evening in a soho gallery where 20 of the images will be displayed in life size. The Question: What are the names of Jam band members? Update: We have our winner so no more emails please!